I have some starter thoughts to share tonight. About words. I just want to get you thinking (yes, YOU!) about the importance of wielding words with care. It's something that has been on my heart for a long time this past year as I have met many new people and developed deeper friendships. I have seen people use words as if they are pieces of candy with disposable wrappers. On the other hand, I also have seen words treated as rare and precious gems to be selected carefully and given away sparingly. I find myself tempted by the candy, but in the end, I long for the gems. I want to know the impact of each word on myself and on others. 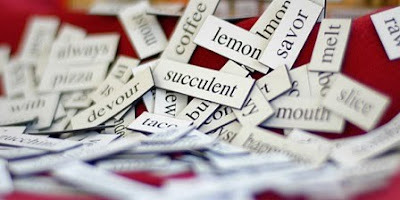 I want to see words used to build up-- and if that means I wield fewer, then I pray that will be my goal. We often hear the phrase "actions speak louder than words" -- but the more I look around me, the more I see that words lead to actions. I see the power of words -- how they can by turns hurt, encourage, manipulate or cheer -- daily in my job as an editor. Though shielded from the faces of our readers by the protection of newsroom walls, I hear the phone calls and read the e-mails, and know that every word we use-- every word we print -- will have an effect on someone at some point in the story writing, producing and printing process. Likewise, in relationships, words define trajectory. They can set expectations and guide thoughts. They can build boundaries or remove them. A few carefully chosen words spoken in a moment can build a bridge of trust; likewise, a few thoughtless words can take trust away. Where are you on the spectrum? Are you a person of many words, or few? What words for you are candy, and what words do you see as gems? I love the candy as well as the gems. A mix of both is not all bad. To answer your questions: I'd like to be the gem kind of person, but fear I am more the candy kind. Pam: I was just talking to a fellow by the name of Kevin last night about the nasty comments people leave on MLive. Whenever I have those conversations with readers (which seems to happen often) it always comes back to the fact that anonymity is a shield that guards us from accountabilty with our words. It's easy to say and do hurtful things when you don't have to leave a name, let alone meet the recipient of your words face to face. Side note: I hope the extra step our MLIve blog tool upgrade added (requiring users to create profiles that track all previous comments they've made) will help people weigh what they say more carefully. Justin: What was the context of that quote? I am not as familiar with Richard II as with some of Shakespeare's other plays. Sometimes I think about "wit and wisdom." There aren't many Proverbs that emphasize the value of embracing wit, and yet we see examples of biblical characters using their wit. One of my favorite examples is Elijah to the prophets of Baal: "Huh, where's Baal? [pregnant pause] Oh, he must be in the bathroom." And yes, seeing humor in the most mundane events and being able to capture them on paper-- that's a gift of endless value.